Housed in the former Christchurch on North Main Street Bandon, this unique and charming exhibition transports visitors through time to experience Bandon town as it was in time’s past. Christchurch dates back to circa 1610 and is built on the site of a Danish Fort. It was one of the earliest Protestant churches in Ireland and was a church for 363 years. It was deconsecrated in 1973. Some Bandon church records are held at the West Cork Heritage Centre. A portion of the old Bandon walls are part of the structure of the building. 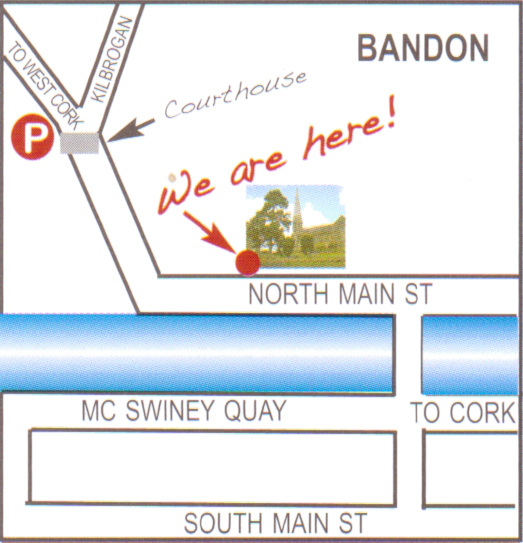 The church now hosts a series of exhibitions with the theme of Bandon’s history. Visitors can see replicas of an old shop, school, kitchen and forge. The current exhibition also includes the old town stocks and memorabilia from Bandon’s time as a garrison town. School tours are welcome. Please contact us to arrange group visits in advance. Marven, so sorry we didn’t see this until now. The time it would take depends on how much you want to stop and read information and background histories. To really enjoy it you should allow an hour to an hour and a half. If you want to really look at everything in depth maybe allow a bit longer. Thank you for your query Sean admission is €5 adult, €2 seniors and family rate €7. Do you have Marriage ,Birth, Death & Baptismal Records ? If so how far back do they go ? so, just turn up to study records? Hi Mary, an appointment is needed to see the records. Please contact us on the number on right so we can advise you further. Please email westcorkheritagecentre@gmail.com to send your family information privately and directly to us.